This past weekend, the Emerald Islanders traveled to the Czech Republic to play three developmental friendlies versus stiff competition from the Israeli, German, and Swedish developmental squads. The Islanders lost two close contests against Israel (8-7) and Sweden (11-10). But, would put in an excellent effort against and come away with a massive 17-7 victory over the German side. National team Clancy Almas was happy with the team’s overall performance. Commenting that it was, “a great battle and great weekend” for the squad. Mike Cregan was again solid throughout the weekend in goals. While 2015 national team alternate Sean Murphy looked poised in his only appearance in goal. Offensively, the Islanders were led by Darren O’Gorman (9,3), Sean Gibson (7,3), and Drew Wichmann (5,3). Defensively Mike Bradshaw and Ryan Doran led from the back with a relatively inexperienced defensive unit. 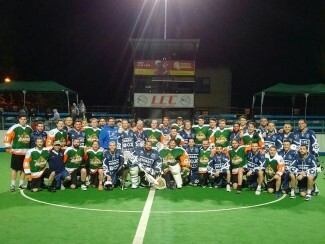 “Overall it was a great weekend for the Irish Indoor Lacrosse program with so many new faces getting solid game time. The guys got better each game and it was great to see contributions all over the floor especially from so many new faces.”, said Ireland’s Indoor Lacrosse Development Director. Speaking of new faces, Michio Clark, Liam Kirwan (16), and Sam Burgess all scoring goals throughout the weekend. Combined with contributions from Thomas Riley, Sam Cooper, Luke Murphy, and Conor Dockery; made for a great few days in Prague.